We’ve made some improvements to the administrator navigation menu bar. Now all of the sections you need are grouped in a single convenient drop-down menu. All of the familiar navigation paths you’ve been using haven’t changed; they’re just easier to get to. For more details about the Admin section, see the Administrator overview. We reduced the size of the banner that displays time and usage limits for a sharing portal. The critical information you need is still there—it just takes less space. For more details about sharing portals, see Sharing VMs and environments with sharing portals. For some regions, Skytap has enabled VMs with up to 512 GB of RAM and up to 24 CPU cores. The Suspend action works only for x86 VMs with 256 GB or RAM or less. Neither Power A particular type of CPU that supports IBM i, AIX, and Linux in Skytap Cloud. VMs nor x86 VMs with more than 256 GB of RAM can be suspended. For more information about configuring CPU and RAM for VMS, see Overview of VM hardware and guest OS settings. For more information about power-state limitations for large-RAM VMs, see Suspend isn’t supported for Power VMs or x86 VMs with more than 256 GB of RAM. We are accepting nominations for the Skytap Technology Preview Program for IBM i. This is a first-to-market, public cloud capability available only from Skytap. We are seeking customers to work with us as we prepare to release this capability to market. During technology preview access period, our goal is to work closely with organizations who are interested in moving their IBM i applications into the cloud. Program participants will provide direct feedback to Skytap product managers, help shape the product, test features of Skytap, and ensure that your IBM i application runs successfully in Skytap. Mid-September 2018 – October – Customer nominations. November 2018 – Customer kickoff & onboarding sessions begin. November 2018 – January 2019 – Technology preview access period. A preview program buddy for each customer. A weekly checkpoint call (30 min). Technical support & a private Slack channel for communications. Cloud resources and assistance moving IBM i applications into Skytap. A Skytap account for each participating company for the duration of the Technology Preview Program access period. A minimum of one IBM i application to be tested during the Technology Preview Program access period (must be IBM i 7.3). 1-2 resources for approximately 5-8 hours per week. Agreed schedule demonstrating shared progress through the Technology Preview Program. Willingness to provide quotable text and to act as a reference upon successful completion of the Technology Preview Program. There is no cost for the customer to participate in this Technology Preview Program but participants must accept the program terms. During the technology preview period, each customer Power VM can be configured to use a maximum of four (4) vCPUs. Course Manager is new standalone offering that is available as an add-on to a Skytap customer subscription. It provides an array of functionality for instructor-led Training, self-paced training, and sales demo delivery out of the box. For more information about Course Manager by Skytap, see Course Manager by Skytap Cloud. Skytap has updated the Reporting page to provide a visual display of usage for your account. Skytap Cloud administrators can now see current account usage or usage over time. Additionally, the new reporting page can be customized to display different report types, different platforms (if your account supports multiple platforms), and different usage types. Administrators can view usage data from the Reporting page or export CSV reports for detailed analysis in external applications. For more information about usage reports, see Viewing usage data. The Skytap Advanced Import Appliance has been updated to v0.4.1. This update includes Transfer estimation and the ability to completely reset all of the import lists. Details are available for VMs before they’re queued for import, after they’re queued, and while the import process is active for the VM. For more information about importing VMs with the Advanced Import Appliance, see Importing VMs using the Advanced Import Appliance. 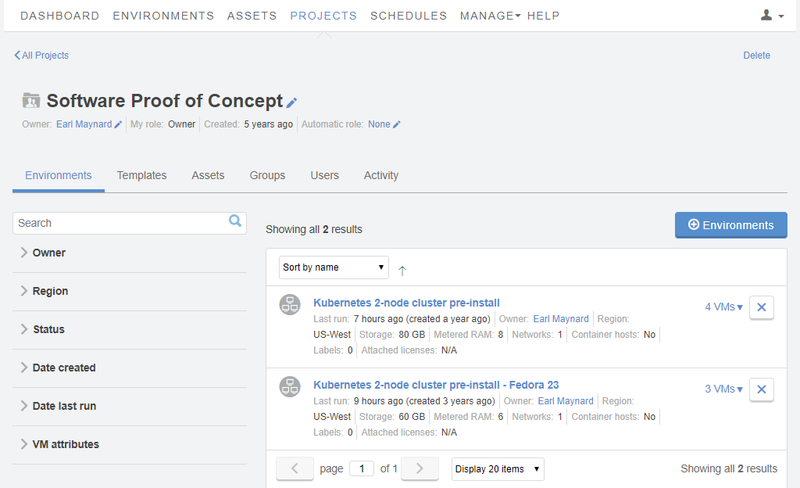 We’ve added search capabilities to the Users and Groups tabs of the Projects page. For more information about managing projects, see Sharing resources with projects. We are now accepting nominations for the Skytap Technology Preview Program for IBM i. This is a first-to-market, public cloud capability available only from Skytap. We are seeking customers to work with us as we prepare to release this capability to market. We’ve updated the Projects page to make it easier to create and manage projects. The Advanced Import Appliance can now display details about the VMs that you import. Sometimes an intensive operation is rate-limited when there is too much activity across your customer account. Rate-limited operations are now visible in the Environment Details page, the environments list, and in audit logs. In addition, you can now use Rate limited as a filter in the list of environments to quickly find any rate-limited environments. For more information about rate limiting, see Why is my operation rate-limited?. For details about the rate_limited fields in the API, see Environment VMs reference URI (v1) and Environment VMs reference URI (v2). We’ve updated the error message returned by the Skytap REST API when a VM fails to respond to a runstate change request to suspended or stopped. The operation failed because VMware Tools is not installed. Please install VMware Tools. The operation failed because VMware Tools is still loading. Please try again momentarily. The VM guest OS is not responding. Wait a few minutes and try again. If you use a script that checks for one of the old messages, you may have to update the script. Skytap is continuing to update security. In this release, we’ve provided more robust cryptographic algorithms for VPNs. For more information about configuring VPNs, see Creating a VPN connection to your Skytap Cloud account. The Skytap Health Dashboard displays overall health of Skytap as well as details about each of the regions. It also displays a history of past incidents and their resolutions. For more information about viewing Skytap status and subscribing to status updates, see Viewing the Skytap Cloud Health Dashboard. Skytap also recently made updates to your marketing email preferences and account information. Skytap continues to grow! To meet increasing demand for data center capacity on the eastern coast of the United States, Skytap has opened a second multi-tenant data center in this region: US-East-2. US-East-2 is an independent data center that does not share regional limits or capacity with US-East. The US-East-2 region is now generally available. To enable the US-East-2 region for your account, work with your primary account administrator to contact Skytap. For learn more about Skytap regions, see Understanding regions. Though AIX is generally considered a command-line-driven operating system, some AIX software is optimized for installation from a graphical user interface (GUI). If you need an AIX GUI, you can enable a Skytap AIX VM as an X11 client over an SSH published service and connect to it using an X Windows GUI. For more details about configuring an X Windows display for an AIX VM, see Connecting to an AIX VM with X Windows. 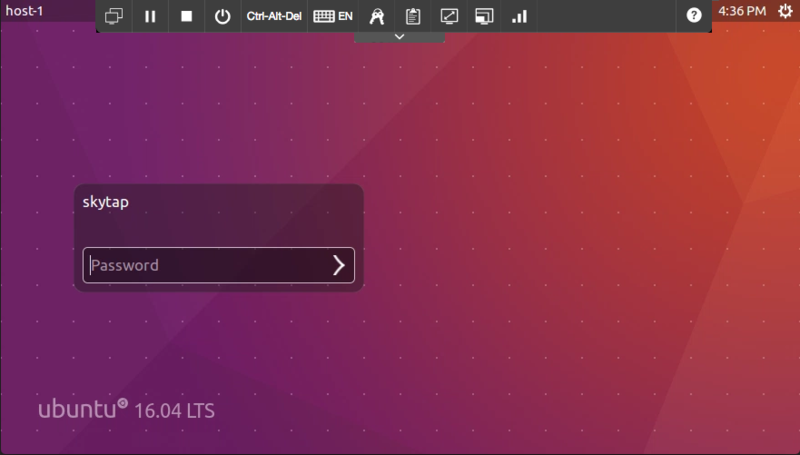 Skytap has added new and updated pre-built virtual machines to the public template library, including a public template for the new Ubuntu Server 18.04 LTS release. Skytap public templates are a useful starting point for building new environments or testing new technologies in your application stack. For information about viewing and using public templates in your account, see Skytap Cloud public templates. Skytap now provides advanced messaging if a usage report is too large to run. Rather than time out over a period of several minutes, the report will fail quickly and display a message indicating that the report is too large. Use the filter parameters on the page to select a shorter date range, or to apply filters to the report. For detailed instructions, see Generating usage reports. The REST API v1 now supports operations for automatically shutting down environments when they are idle, or at a specific date and time. This functionality was added for the REST API v2 in the previous release. For instructions, see the updated reference documentation for the v1 Environments resource. Skytap now provides options for customizing the types of marketing and product team communications you want to receive. During a one-time step, you’ll be prompted to update your marketing email preferences and provide your country of residence. This helps ensure that Skytap is sending you the most relevant information, and that we are honoring all applicable data laws in your country. You can change your marketing email preferences or country of residence at any time from the Account page in Skytap. NOTE: Skytap has deprecated the previous checkbox that was used to indicate whether users wanted to receive marketing emails. Deprecated option for setting marketing email preferences. REST API v2 users: To ensure that all marketing email preferences are correctly logged, the REST API field (wants_email) associated with the /v2/account resource has been deprecated. Previous values have been replaced with a null value, and the field is now read-only. Attempts to edit this field will be ignored by the REST API. Users should manage their marketing email preferences at http://research.skytap.com/Email-Preference-Center.html. Skytap has added the option to automatically shut down an environment if it is not being used. Previously, the only option was to suspend the environment. By automatically shutting down an environment when it’s not in use, you halt the SVM hours and concurrent SVMs consumed by the environment. This automated action helps you better manage your SVMs subscription. Automatic shut down occurs more quickly than automatic suspend, freeing up resources for other environments. Administrators can set an account-wide default power option for inactive environments. Each time a new environment is created, it inherits this default automatic suspend or shut down option. For instructions, see Managing account-wide settings. Users with permission to edit an environment can change the automatic suspend or shut down setting for that environment. For instructions, see Automatically shut down or suspend inactive environments. For more information about how Skytap detects whether an environment is in use, see Automatically shut down or suspend inactive environments. The Environment Details page for each environment now displays an Activity tab, which provides information about the last 20 actions performed on the environment. This feed is especially useful for shared environments, where more than one user may be editing the environment or altering its power state. Administrators can view additional activity on an environment by generating an Auditing report. The Advanced Import Appliance is now available as a Docker container from the Skytap Docker repository: https://hub.docker.com/r/skytap/advanced-import-appliance/. The Advanced Import Appliance is a self-service tool for uploading VMs into Skytap. By installing the Advanced Import Appliance on your local machine with Docker, you can validate that your VMs meet the import requirements before uploading them Skytap, as well as automatically create and manage multiple import jobs. For general information about importing VMs, see Overview: Importing VMs, LPARs, and vApps into Skytap. The Advanced Import Appliance Docker container replaces the previous beta iteration of the Advanced Import Appliance, which was published as a downloadable OVA file and called the Cloud Import Management Appliance (CIMA). The OVA version of appliance will no longer be supported. Please install and begin using the newer Docker container. Account administrators can now enable email notifications for SVM or storage usage against department limits or account-wide regional limits. For example, if regional limits are enabled in your account, Skytap can notify administrators or other users when the account is at 90% of its concurrent SVMs limit in a specific region or any region. Or, Skytap can notify administrators or other users in the account when a specific department or any department reaches 90% of its SVM hours limit. For instructions, see Setting up usage notification emails. Additionally, please see our note about current and upcoming deprecations to select VPN configuration parameters. Skytap natively supports a wide range of operating systems running on x86 and POWER8 hardware. Now, in addition to running AIX workloads in Skytap, you also run Linux on Power operating systems, including: Ubuntu Server, SUSE Enterprise Server, and Red Hat Enterprise Linux, and more. With x86 and Power VMs hosted side-by-side in a single virtual environment, you can easily clone, manage, and share your complex legacy application stack. To learn more, see Using Power VMs in Skytap. Skytap now supports Private Network Connections from your data center to any Skytap region, enabling faster speeds and lower latency than Internet-based connections. For general information, see Overview: Private Network Connections and VPNs. To begin the process of creating a Private Network Connection, contact your Skytap sales representative. If you are sharing a direct link to a VM Secure Remote Access (SRA) browser client session, you can optionally append one or more URL parameters to control the initial VM display settings. For more information, see Optional URL parameters for sharing an SRA browser client view. The Private Networks section of the Admin panel has been renamed WANs. Administrators can use the WANs page to view and manage VPNs and Private Network Connections in the account. In several places throughout the product, you may see references to Private Networks changed to WANs. On April 6, 2018, the modp768 encryption method for both Phase 1 Diffie-Hellman (DH) group and Phase 2 PFS group will be removed from the Skytap VPN Settings. After April 6, no new VPNs can be configured to use the modp768 DH group. On May 4, 2018, VPNs that still use the modp768 DH group will be disabled. If you have existing VPNs that use the modp768 DH group, you must reconfigure them. We strongly recommend that you use the modp1536 DH group. Also on May 4, 2018, the modp1024 DH group, the md5 Phase 1 hash algorithm, and the hmac_md5 authentication algorithm will be deprecated. Though it will still be possible to create new VPNs with these protocols, we strongly recommend that you use modp1536 DH group, sha1 hash algorithm, and hmac_sha1 authentication algorithm. The browser-based Secure Remote Access (SRA) client now supports SSH connections to *NIX VMs (for example, Linux and AIX VMs). The Standard SRA connection type allows users to interact with and view a VM using their standard keyboard and mouse. If multiple users are connected to the same VM from different SRA browser sessions, they share an over-the-shoulder view of the VM. This is the default connection method used by the SRA browser client. It does not require any additional VM configuration steps to work properly. The SSH connection type connects to an SSH service running on the VM. This allows multiple users to have concurrent, unique SSH sessions on the VM. The SSH connection is made through Skytap Cloud’s secure infrastructure; it does not require an external published service or other public internet access point. Enabling SSH on a VM for use in SRA browser client sessions. Using an SSH connection during an SRA browser client session. This feature must be enabled in your account. The VPNs section of the Admin panel has been renamed Private Networks. In several places throughout the product, you may see references to VPNs changed to Private Networks. Skytap natively supports AIX 6.1, 7.1, and 7.2 running on IBM Power Systems alongside traditional x86 workloads and containers. This lets you create blended virtual environments that can be cloned, shared, and managed as a single unit. For detailed instructions about moving your AIX LPARs into the cloud, see Importing AIX LPARs into Skytap. For general information and a sample use case, see AIX workloads in Skytap Cloud. You can now specify a custom RDP port number when configuring a VM to support RDP connections through the browser-based Secure Remote Access client. RDP is typically enabled in the Secure Remote Access client to support VM audio input and output between a Windows VM and the user’s browser. Enabling audio for a VM. Using audio with a VM. Accessing VMs with your browser. If In guest Remote Desktop connectivity is not available, this feature has not been enabled in your account. The VM Hardware Settings page has been reorganized to group together the settings that affect the user’s experience when accessing the VM through the browser-based Secure Remote Access client. The keyboard language mapping for the on-screen keyboard and how the VM interprets keystrokes. Whether the user can use VM audio during the browser client session. Whether the user can copy and paste text to and from the VM. For more information about these settings and other options on this page, see Overview of VM hardware and guest OS settings. For 2017 Skytap release notes, visit Archive of 2017 What’s new. For older release notes dating back to 2011, contact support@skytap.com.